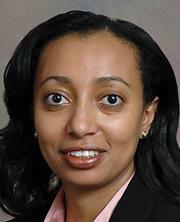 Dr. Ghebre received her medical degree from the University of Michigan Medical School. She completed her specialty and subspecialty training in Gynecologic Oncology at the University of Minnesota and received an MPH degree from the Johns Hopkins Bloomberg School of Public Health. Dr. Ghebre is a board certified gynecologic oncologist and has a deep interest in cervical cancer prevention and HPV vaccine. Dr. Ghebre has acquired specialty training in the Intuitive Surgical da Vinci Surgical System.